Boasting fantastic views over the Corfiot countryside to the sea towards Albania, Villa Adonis enjoys an excellent location close to the beautiful Kerasia beach and centre of Agios Stefanos. There are a selection of shops and places to eat within easy reach with a supermarket only 5 minutes away by car. The villa also has 4 en suite bedrooms and free air conditioning/heating in the bedrooms, WIFi and pool heating is included. Outside, Villa Adonis has a brick BBQ to one side of the terrace as well as a dining table and chairs, and a comfy seating area. A path from the terrace leads down to the swimming pool which has ample space to relax and enjoy the view before a much needed dip to cool off! The accommodation is centered around a covered courtyard area which has a second table and chairs. Villa Adonis has a private driveway with steps up to the villa entrance. The spacious main living area is on the left of the courtyard. There is a table and chairs and comfy seating around the brick feature fireplace, overlooked by the fully equipped kitchen area adjacent. Patio doors open onto the raised terrace which boast fantastic views over the private swimming pool to the sea and countryside beyond. At the far side of the living area is a spacious double bedroom with an en suite bathroom. Stairs from the living area lead up to a twin bedroom on the first floor which also has an en suite shower room and beautiful views over Kerasia Bay to the Albanian mainland on the horizon. On the right side of the courtyard is a twin bedroom with an en suite shower room, leading into a second double bedroom with an en suite bathroom and patio doors onto the terrace. The double bedroom also has stairs up to a mezzanine level which is not accessible. This villa is registered and licenced by EOT Greek licensing association. This number is: AM: 38418. Located on the hillside between the bays of Kerasia and Agios Stefanos, Villa Adonis enjoys fantastic views over the islands' North Eastern coast across the sea. A choice of excellent tavernas and mini markets, as well as a larger supermarket, are all within a short drive making this charming 4 bedroom villa ideal for anyone wanting their own space, but with the beach and a choice of facilities all close at hand. The quaint coastal villages of Kaloura and Kalami are close by and can be easily explored by boat or by car. Kalami has a choice of fantastic tavernas centered around its picturesque pebble beach, whilst Kaloura has an excellent fish restaurant overlooking the boats in the harbour. Kassiopi, the largest fishing village on the North East coast, has a wide selection of tavernas, bars and gift shops, around 15 minutes drive from the villa. The nearest beach to Villa Adonis is at Kerasia, a pebbly but picturesque beach with clear water, ideal for paddling and snorkelling. The beach also has a great waterside taverna where you can take a break from the sun and enjoy a drink or traditional tapas lunch. For those that prefer to get out and about the ideal way to explore is by boat either on a small private excursion such as 'Nautilus' boat trips or independantly by hiring your own small boat for the day. For those that enjoy driving the lovely North East Coast is easily accessable by road as are the inland areas of Corfu. Villa Adonis is not available to book for season as it is sold out. 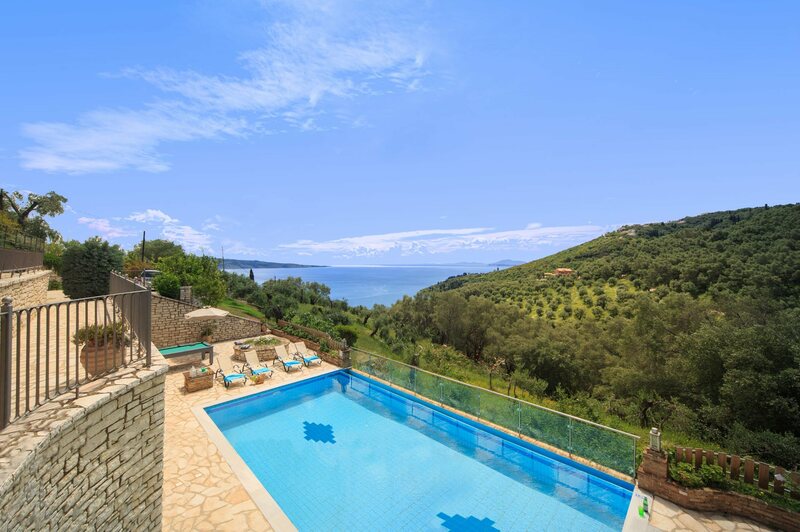 Take a look here at the Corfu villas that are currently on sale. The clear waters around Corfu are lovely for scuba diving and there are various scuba diving schools around the island. Some of the better known are Water hoppers who operate from Gouvia and Ipsos and Dive Med who have a school on the other side of the island in Paleokastritsa. There is also a diving school in Kassiopi. There are usually opportunities for all levels of diver and for lessons that lead to diving certificates. Always check your travel insurance and take qualification certificates with you when you go scuba diving.